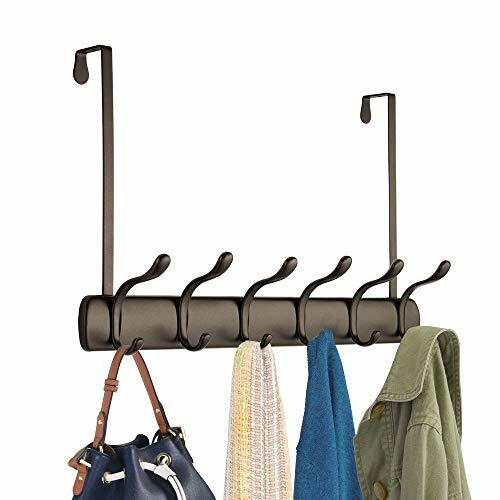 Color:Bronze The mDesign over-the-door 12 hook organizer rack is the perfect way to keep your hallway and bedroom closets neatly organized. The hooks easily install by simply hanging over interior doors for instant storage right where you need it! The mDesign over-the-door twelve hook organizer rack is the perfect way to keep your hallway and bedroom closets neatly organized. Offering six double hooks on one unit, you can store outerwear, jackets, belts, pashminas, sweaters and other clothing and accessories. The hooks easily install by simply hanging over interior doors for instant storage right where you need it! - A child's room is much easier to organize with a hanging hook rack. They provide a set place on a backpack or large hanging laundry bag. The bag could be hung for the purposes of holding clothes or stuffed animals. It can even be used for hanging common pairs of shoes that a child likes to wear on them. Use the hooks to keep tabs on highly used or lost items to stop unnecessary searches. - Over the door storage is essential to maintaining organization at home. The hanging hooks hold robes and other clothes in a closet or bedroom. It also serves as a versatile tool for organizing accessories. Use hanging storage as a purse holder hook, or for ties and belts. It is convenient to use for any clothing or accessories that are worn most frequently. The storage hooks neaten up the room while providing availability to items when required. - Bathrooms never seem to have enough storage. 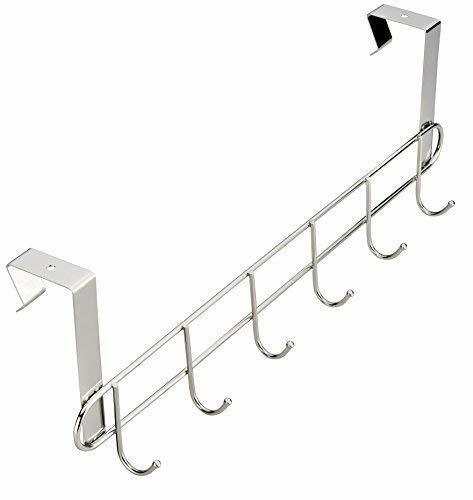 Turn this clothes hook rack into an instant towel rack for it. Hang a toilet paper holder from it for quick access to rolls when they are needed most. For occasions when delicates need to be hung in the bathroom to dry, these hangers will do nicely. Loofas, handled washing brushes, and tub stoppers hang easily from these hooks. Never loose them or any other hanging bath items again. - Kitchens benefit from door kitchen hangers. A kitchen door hanger can organize tools, pots, pans, and aprons. The stainless steel kitchen hooks will store a variety of necessary kitchen items. Put detachable appliance cords on it and cut down on loss or separation. Kitchen towels, pot holders, and oven mitts can finally have an organized spot. Well appointed kitchens are more productive. The padding on the back of each door kitchen hanger is padded to prevent surface door scuffs and scratches.